Here's just a short post to address a question that comes up fairly often. 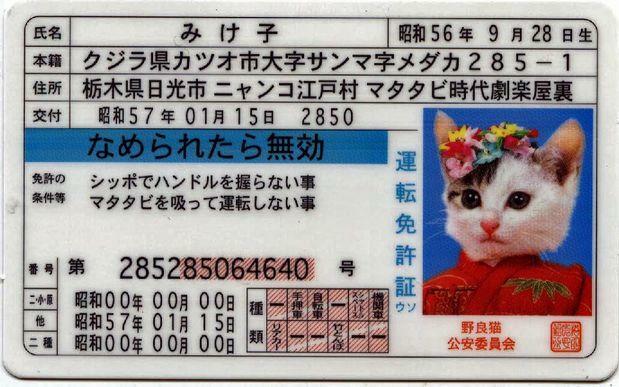 When you change your address within Japan, you are required to update the address on your driver's license as well as your Alien Registration Card. City Hall doesn't handle this request. Rather, all driver's license procedures (besides the actual issuance of a license) are handled by your local police station. Before you go out, though, make sure you've already updated the address on your Alien Registration Card at your city office. The Alien Registration Card will be your proof of identification when the police copy down your new address to your driver's license. You'll need to find out which station's jurisdiction you're in, then visit that station during it's open hours. The word for police station in Japanese is 警察署（けいさつしょ）, and you can put that term to use by searching for your city or town name + 警察署 in regular Google search or on Google Maps. Police stations are usually open on a schedule similar to the immigration bureau and other public offices: That is, they start opening around 10:00 and briefly close for lunch between about 12:00 and 13:00. My local station stays open as late as 17:30, but they stop accepting applications for procedures around 17:00. It would be wise to arrive as early as possible or to call ahead to check your station's open hours. By the way, if you are lucky (?) enough to live in a city with a regional licensing bureau, the bureau will handle all license-related procedures for local residents. Because of that, the police stations in these cities do not handle license-related procedures. Thank you, this was convenient! Did the change of address cost money, and if so, how much? I'm assuming they at least had to remake your license card with the new address. This was not very helpful. What did it cost? What kinds of forms or ID are you required to bring along? Is there a time frame in which this must occur from the date of moving? Thanks! Very helpful. Japan being the ultra bureacreautic country you gave me peace of mind to go about the procedure. What else documents required ? Do they ask for "juminhyo"? Or just alien card is enough ?